The white house to the rear of the photograph was originally the property of J&G Wells the local colliery owners ,and was used by their colliery agent Mr Arthur Hayes until he went to live at Whitwell on his retirement . He had a gardener/handyman called Billy Fretwell who later worked in the lamp cabin at Westhorpe colliery. Arthur Hayes always drove a large Rover car and wore a trilby hat and liked smoking large cigars somewhat like Winston Churchill. In the fruiting season Mrs Hayes would always put out a table at the gate with apples and pears for anyone to take, if your mum wanted cooking apples you asked at the door, and she was always willing to oblige. Arthur Hayes 1878-1950, my 2nd cousin 3x removed, his wife is buried in Eckington cemetery, stone exists. 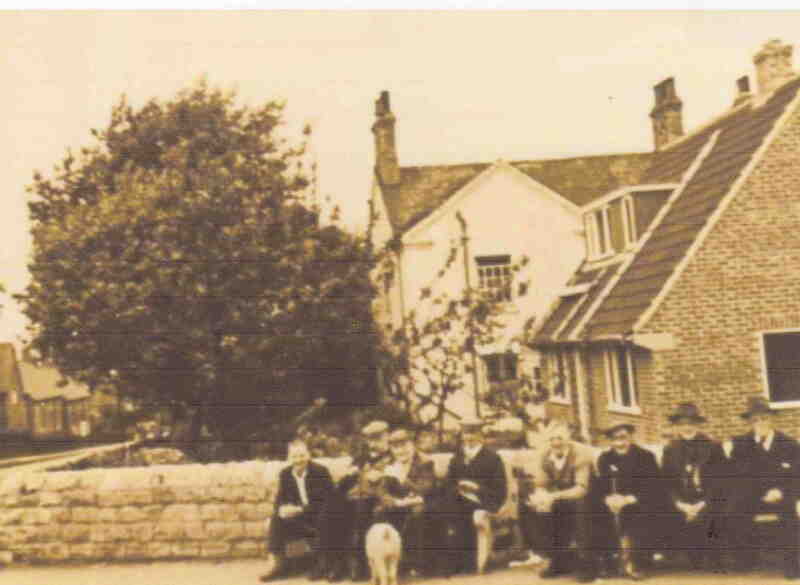 Arthur Hayes was my grandfather – he lived at Gannow House 1930-1947? – I think they moved to Whitwell after Nationalisation – and I visited very often as a child, though I remember the house as large and red brick, with lots of outbuildings and land including a walled flower and vegetable garden inside the wall round the corner – a high wall, with high gates. How did it change? The colliery band played in the yard for us at Christmas. I like Ken Wain’s description – is there any more? Hi Carole .. I find your comments really exciting! I’ve recently bought Gannow house and I’ve been desperately trying to find out any history or old photos. :)! really good to hear from you. i thought the house had been demolished. have you got a photo of the house now so i can see if it’s the same place. thanks so much. let me know your email and then i can send you a piece i’ve written about Christmas at Gannow in the 1940s. very best wishes, Carole. I read with interest, about Arthur Hayes and Gannow House. Mabel was my great aunt (my grandmothers sister). Whilst being too young to have visited them at Gannow, my late father certainly did. I do remember as a child, my father driving past Gannow to show us where Arthur and Mabel lived. I believe Mabel lived with her family in Eckington, before marrying Arthur, where they ran a private school. Prior to that, they lived in Paradise Square in the centre of Sheffield. I would be very interested in knowing more about Arthur, as my father was very interested in coal mines and Arthurs work in J & G Wells. Sorry Pete but its Harry Mossman Jenkins used to live at 25 Rotherham Road. Harry Jenkins was my grandfather and did indeed live at No. 25 Rotherham Road. The photo is too blurry to be sure, but it looks a lot like him. Can anyone give a name for the unknown man? My dad is pretty sure it’s his grandad Joseph jenkins ..